Write Reviews and Earn Rewards with Military Town Advisor! Join me and think about preparing for your next PCS move. Do you know anyone located at your next duty station? Do you have any friends knowledgeable enough in the area to guide you to a good neighborhood to live? What about schools, churches and jobs? Chances are, you have connections in many of your future duty stations, but not all of them. Thankfully, Military Town Advisor gives you a friend's perspective of your new location when you don't have those personal connections. What is Military Town Advisor? Military Town Advisor is a "PCS relocation resource and military housing site that allows military families to help other military families by writing reviews about military towns. When searching for information about where to live on our military housing site, read reviews about military housing, off base neighborhoods, areas surrounding the base, apartment complexes, condominiums, and schools." The site functions by allowing families to review their favorite or least favorite places about their current duty station. These reviews inform other families where to go or stay away from as they prepare for their next PCS move. Military Town Advisor is most effective when more military families pay it forward and submit their reviews online. The more reviews, the more thorough the information. In order to encourage families to share their experience and knowledge, Military Town Advisor created an Incentive Program. 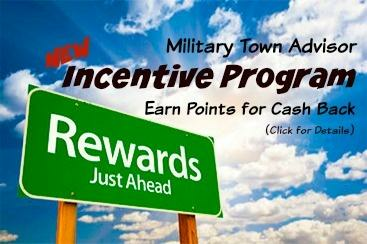 This Incentive Program allows Military Town Advisor users to accumulate points when they write reviews. MTA "understands that your time and knowledge is valuable so [they would] like to reward you for writing reviews. The motto of [the] website is to Pay It Forward and help other military families. You are paying it forward by sharing your knowledge and advice with other military families, and [they] are paying it forward by rewarding you for your time!" Here's how the Incentive Program works. Put simply, the more reviews you write, the more points you earn, the closer you are to earning your next personal Amazon gift card! Log in so your reviews are saved under your profile name. Your review must be between 50 and 500 words. Positive and negative reviews are welcome. Your review must be about your personal experience, not something you've heard from someone else. It must provide insight and value to a reader. You can not be affiliated with anyone or any business that may benefit from your review. Military Town Advisor has the right to discontinue this program at any time. You can find examples of acceptable and unacceptable reviews here so you can begin earning points right away! Start writing your Military Town Advisor reviews and earning points today! If you have any further questions about the program or how to get started you can contact MTA's customer service.